Many other animals besides birds and deer make their homes on the Conservancy. However, very little research has been carried out, so that knowledge is limited. Animals are mobile and do not heed property lines. Pleasant Valley Conservancy is situated in a highly wooded area where there is little real estate development. Probably no more than 10% of the land in the Valley is under agriculture, and the unfarmed and wooded land provides good habitat for wild animals. Of the larger animals, coyotes and foxes are common, which, when trapping was permitted, were occasionally caught. Beaver (Castor canadensis), a semi-aquatic animal, is nocturnal and hence rarely seen, but its activities are easy to spot. The usual situation is that the beavers move in, dam Pleasant Valley or East Blue Mounds Creek, cut and eat small trees until they have exhausted their food supply, and then move on. 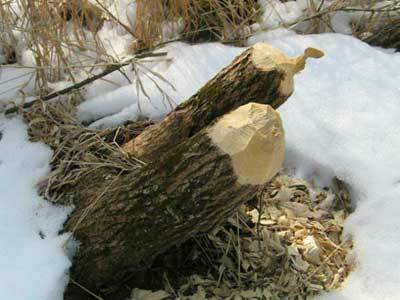 We have seen at least three "waves" of beaver activity during the past 25 years, followed by quiet periods. The photo below, taken in February 2007, gives an idea of the impressive "logging" that these creatures can carry out. The second photo shows the dam they have created at the outlet of the creeklet that passes through Pleasant Valley Conservancy. Even though this dam is small, it is holding back a lot of water because of the critical place it is located.. When beavers are present, they cause significant changes in the hydrology of the wetland, altering stream flow and flooding the bottom land. Sedge meadows may change into cattail marshes, and then recover once the beaver are gone. 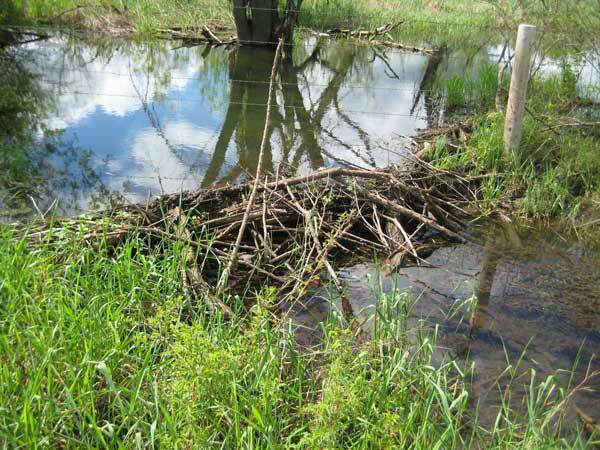 Although beaver activities may flood a wetland and affect plant populations, this flooding has positive benefits for waterfowl. In recent years, perhaps as a result of beaver flooding, in addition to sandhill cranes, Canada geese have begun nesting on our wetland. At one time the Wisconsin Department of Natural Resources attempted to remove beaver dams from East Blue Mounds Creek with dynamite. However, current policy is to only remove beaver dams where trout stream protection is the highest priority. Our area is in Beaver Control Zone C, where beaver populations are considered low to moderate and the management goal is to maintain a stable population. Muskrat (Ondatra zibethicus) is a medium-sized semi-aquatic rodent which is widespread in our wetland. Like beaver, muskrat are primarily nocturnal, although they may occasionally be seen swimming during the daytime. Muskrat can easily be distinguished from beaver by the tail. The beaver has a wide fan-like tail, while the muskrat has a long rat-like tail. At one time, muskrat lodges were quite common at Pleasant Valley, but due to changes in hydrology as the result of beaver activity, they have mostly been flooded out. Muskrat continue to thrive in the wetland, however, burrowing into the stream banks, where they form extensive tunnel systems. Muskrat "houses" always have an underground entrance, although the house itself is of course above water level. When trapping was permitted at Pleasant Valley, a local trapper often took 25-50 muskrat pelts in a winter. Muskrat trapping is strictly regulated by the Wisconsin Department of Natural Resources. The wetland abounds with frogs and turtles, but no information is available on kinds or abundances. Snakes Large snakes are often seen, the most common being the eastern fox snake (Pantherophis gloydi). We often find fox snakes in the cabin that we use as a field station, where they make a living catching mice. As many as three large fox snakes have been seen in the cabin at the same time, draped across the upper shelves. Although the rock outcrops on the south-facing slope would seem to be ideal rattlesnake habitat, no rattlers have ever been seen.